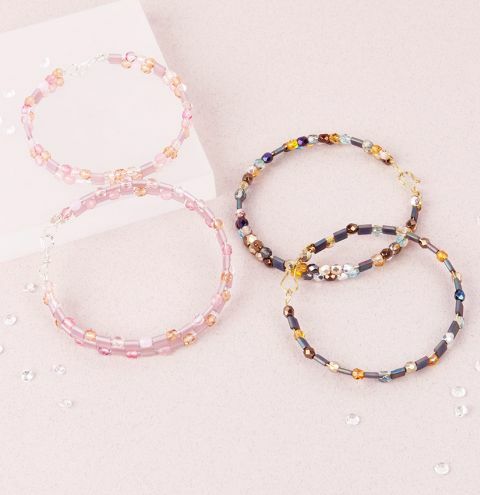 Create a cute collection of beaded wire bangles using fire polished beads and tila beads. Cut approximately 18” of wire. 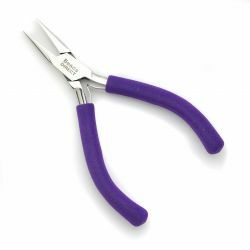 Place your round nosed pliers at the centre of the length and bring the wires around to form a circular link. Twist the link 360 degrees to secure. 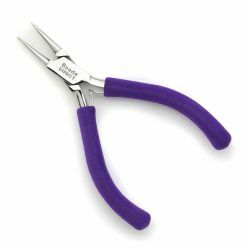 Cut 9” of wire and using your round nosed pliers, create a centred loop (like an eye-pin) at one end. Attach this loop into the link in Step 1. Using the tips of your chain nosed pliers, bend the wires on each side of the loop (in Step 1) 90 degrees, so that you now have 3 parallel wires running down from your central end link. Thread 2 x 4mm round beads on one of the outer wires and one on the other, leaving the central wire empty. Thread the tila bead on the wire with one bead as well as the central wire. Thread one 4mm round bead on the wire (that begins with one bead) and push it up the wire, so that it sits above the tila bead. Repeat this pattern using a tila bead and round bead … until you have beaded approximately 7” (or, the length required for your wrist measurement, allowing an extra 1” for the clasp). Bring the side wires together and wrap to secure around the central one. Trim these wrapped wires, creating small spirals with the ends, bringing them inwards and flattening over the central wire. Leaving about 1” projecting on the central wire, fold the end and double the wire, by squeezing together with your flat nosed pliers. Secure the wire projecting from the doubled end around its base, near the spirals. Trim and create another spiral. 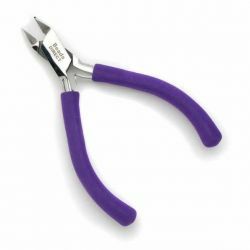 Use your round nosed pliers to form a hook shape in the doubled wire end, and lift the tip of the doubled end to create the lip of your clasp. Find a jar, or small bottle to shape your beaded bangle around (it should be much smaller than the overall bangle size as it will spring open) and spend a little time adjusting the clasp and loop on the opposite side, until you’re satisfied with the fit.